Yummy option for all of you in breakfast. You can make grilled vegetables before time. Cut a circle with knife in middle of bread carefully. Size of one egg. In a non stick pan, in the mean time add 1 tbsp of oil and heat it. Add Ginger garlic and cook till pink color. Now add all the vegetables and grill/ roast/saute them. When they turn little soft add salt, pepper and tomato paste. If you don’t have paste then you can add tomato sauce whichever brand you have. Toss and keep it aside. In a non stick flat surface pan put ½ tsp of oil. Put the bread and in the middle of bread break the egg. Let it cook on medium low heat. Slowly turn the bread, when one side is cooked. Cook both sides, if egg falls outside then don’t worry try to move the egg with wooden spatula back on bread. 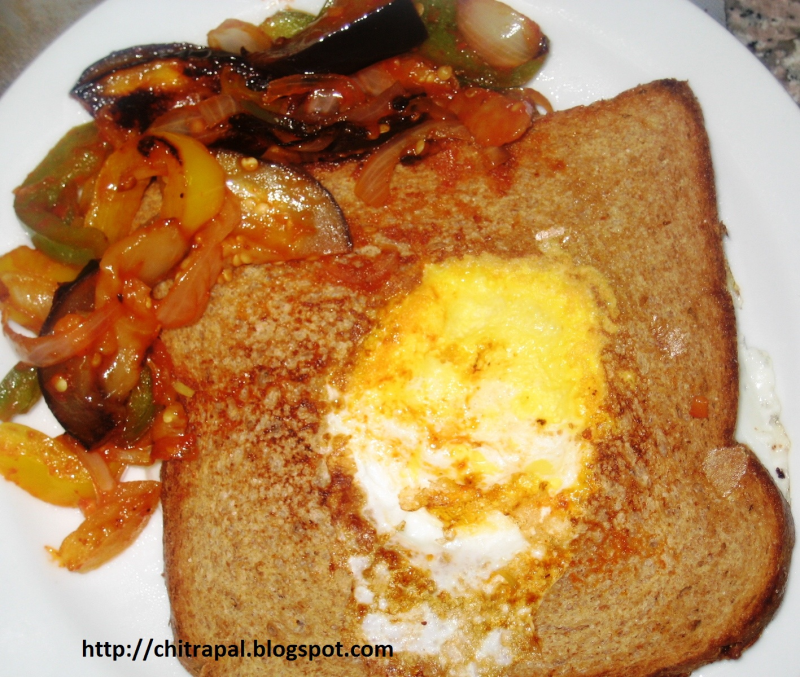 Egg hole Sandwich is ready serve hot with grilled vegetables. Trust me your children will love it and they will eat vegetables, especially eggplant. Hi Chitra, nice & creative,kids will enjoy it I am sure. Thanks 4 sharing.